Proprietary Name: Full Spectrum Matte Ambition Skin Primer Spf 20 What is the Proprietary Name? Non-Proprietary Name: Ensulizole What is the Non-Proprietary Name? 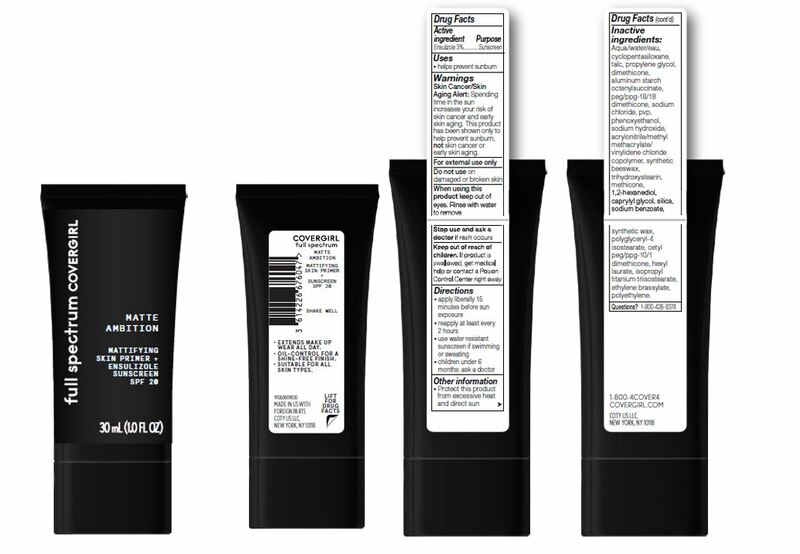 Full Spectrum Matte Ambition Skin Primer Spf 20 with NDC 22700-201 is a a human over the counter drug product labeled by Noxell Corporation. The generic name of Full Spectrum Matte Ambition Skin Primer Spf 20 is ensulizole. The product's dosage form is liquid and is administered via topical form. Aqua/Water/Eau, Cyclopentasiloxane, Talc, Propylene Glycol, Dimethicone, Aluminum Starch Octenylsuccinate, PEG/PPG-18/18 Dimethicone, Sodium Chloride, PVP, Phenoxyethanol, Sodium Hydroxide, Acrylonitrile/Methyl Methacrylate/Vinylidene Chloride Copolymer, Synthetic Beeswax, Trihydroxystearin, Methicone, 1,2-Hexanediol, Caprylyl Glycol, Silica, Sodium Benzoate, Synthetic Wax, Polyglyceryl-4 Isostearate, Cetyl PEG/PPG-10/1 Dimethicone, Hexyl Laurate, Isopropyl Titanium Triisostearate, Ethylene Brassylate, Polyethylene.